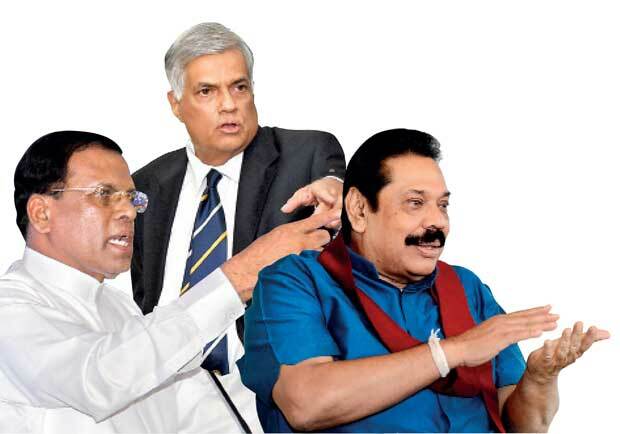 Differences between the two main partners of the so-called yahapalanaya national government seem to have come to the surface to such an extent that leaders of the Sri Lanka Freedom Party (SLFP) and the United National Party (UNP) had to hold peace talks. Reports said that the President, who is also the leader of the SLFP, and the Prime Minister and UNP leader Ranil Wickremesinghe had met to iron out some of the issues that cropped up recently between the two parties. Apart from the challenges thrown and invectives made against the UNP by the SLFP Ministers in the UNP led government, some of the major actions taken by the President and the SLFP Ministers point to a clear rift that, if continued, might even challenge the very survival of the Government. For instance, the President, conceding to request by the Janatha Vimukthi Peramuna and other anti-corruption lobby groups, announced on Monday that he was going to appoint a Presidential Commission to investigate into the Central Bank bond scam, which had been severely censured by a recent report of the Committee on Public Enterprises (COPE) of Parliament. However, it is a well known fact that the UNP from the inception of the allegations on the matter seemed to be of the view that there was no big issue to make a fuss of. The President also has pushed the UNP leaders into a difficult position by rejecting the participation of foreign judges in the proposed accountability mechanism in relation to the human rights violations/war crimes allegedly committed during the last lap of the war. Sri Lanka not only had agreed but had co-sponsored the 2015 UNHRC Resolution on the country which provided for the “Participation in the Sri Lankan judicial mechanism, of Commonwealth and other foreign judges, defence lawyers and authorised prosecutors and investigators” and the UNP leaders seem to be still committed to it. President Sirisena and the SLFP had also changed the contents in respect of declaration of a state of emergency and sexual freedom in the National Action Plan for the Promotion and Protection of Human Rights (NHRAP) prepared by the UNP led government. President had rejected the original provision in the Action Plan that required a two thirds majority of votes for the imposition of a state of emergency and had preferred a simple majority instead. He and the SLFP Ministers had rejected any provision that could be interpreted as decriminalising homosexuality as well. Both sides have been at odds in the recent days on several more issues as well. The SLFP had decided days ago to continue with the Executive Presidential system of governance, while the UNP wants to stick to the promise given to the people during the Presidential Election to abolish it. Following the agitations by the lottery sellers the President had ordered the lottery ticket price to be reduced to the previous Rs.20 from Rs.30, the amount fixed by Finance Minister Ravi Karunanayake, who is a UNP bigwig. Also, the President seems to be not happy with the deals with regard to the Hambantota Industrial Zone and the Tyre Factory which is to be constructed in Horana. A major reason for the differences between the two main parties in the government seems to be the struggle by the President for his survival as the leader of the SLFP and the United Peoples Freedom Alliance (UPFA). Since the ethnic issues also come under the range of differences, there seems to be a possibility of them having a bearing on the much-talked- about and much needed national reconciliation. When President Sirisena’s government took up the anti-corruption drive as the cudgel to tame former President Mahinda Rajapaksa and his loyalists, the latter hit back with the patriotism card, a sharper weapon in the Sri Lankan context and the former seems to have succumbed to it. Accordingly, the President, though on various grounds, had voiced against the arrest of three former Navy Commanders allegedly connected to the Avant Garde issue. He had also expressed reservations about the detention of Army intelligence officers arrested in connection with the disappearance of journalist Pradeep Ekneligoda, on the grounds of delayed justice. Besides, recently he disappointed the minorities who had voted him en-masse during the last Presidential election by inviting for discussions the controversial monk, Ven. Galagoda Atte Gnanasara, who was an eyesore for them. Also he went an extra mile in outsmarting the former President who was a hero among the Sinhala nationalists after the Army decimated the LTTE during his Presidency, by abolishing the Gazette notification issued by the British Raj declaring 37 Sinhala leaders like Monerawila Keppetipola, as traitors. It is against this backdrop that one has to consider the future progress of the government’s Constitutional reforms and reconciliation process on which the international community, including the UNHRC has been pressing the country. It is interesting to note that the process has to go through a test involving nationalistic rivalries on either side of the ethnic divide. As the former and the incumbent Presidents are vying for the Sinhala nationalistic championship in the south, a similar race is on in the north, on the other side of the divide, involving the leaders of the Tamil National Alliance (TNA) and the recently formed Tamil Peoples Council (TPC) under the leadership of Northern Province Chief Minister C.V.Wigneswaran. One of the prominent leaders of the TNA and the spokesman of the main Tamil alliance, Parliamentarian M.A. Sumanthiran, addressing a Thai Pongal event in Batticaloa last Friday had declared that his party would succeed this year in getting adopted a Constitution that would fulfil the aspirations of the Tamil People by providing for them to rule themselves. And the Tamil parties have been stressing the need to incorporate in the proposed new Constitution their traditional demands such as devolution of power, federalism and the merger of the Northern and the Eastern Provinces. As if to exert pressure on the TNA leadership, the Tamil National People’s Front leader Gajendrakumar Ponnambalam, while pointing out several remarks made by President Sirisena at a meeting in Kaluwanchikkudi in Batticaloa said Tamil people would not get federalism or merger of provinces through the proposed Constitutional reforms. In the meantime Suresh Premachandran, the former TNA Spokesman who is currently working with the TNA’s main rival TPC has demanded recently that the TNA leaders resign from the Steering Committee appointed under the Constitutional Assembly, as the Tamil people’s long-standing demands were going to be rejected during the Constitutional reform process. These developments point as to how the nationalistic rivalries in the north and the south are going to make it extremely difficult for the parties involved in the Constitutional reform such as the SLFP under President Sirisena and the TNA under Opposition Leader R. Sampanthan to budge towards a central meeting point. This situation in turn has placed the entire reconciliation process also in the balance.